The all-new Jitsie HT1 helmet is the first helmet in trials to have a seamless integration of the peak into the shell. Its innovative construction design allows for a super modern look of the HT1 helmet. Combined with the wide selection of colors and graphics available in the HT1 range, there will be a match for just about any gear set available on the market. Taking innovation to the next level in trials, the Jitsie HT1 helmet features a polycarbonate shell with comfortable liner and padding that will perfectly fit every rider. The Jitsie HT1 helmet utilises a ratchet buckle system that is reliable and easy to use at the same time. Designed in Belgium, the Jitsie HT1 helmet unites modern graphics, great fitment and superior safety which make it a great choice for every serious trials rider! The new HT1 helmet design offers more airflow than its predecessor for improved comfort and the fully removable interior liner features moisture wicking material in warm riding conditions. 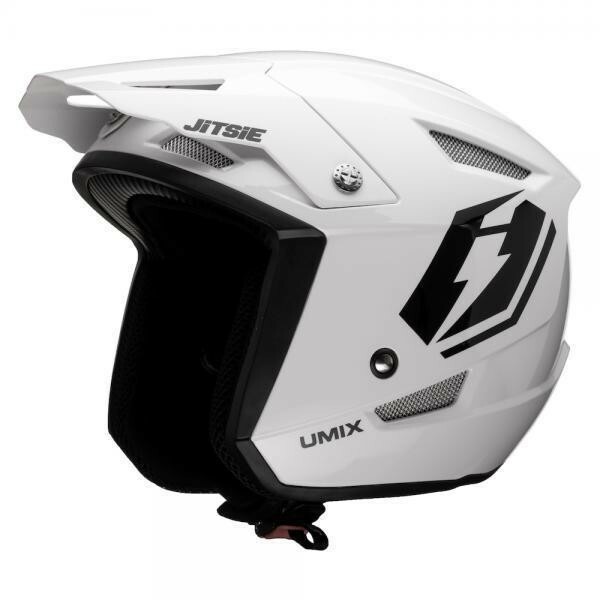 The Jitsie HT1 helmet exceeds ECE R-22-05 standard. With a weight of only 1100g (+-50g), it is one of the lightest polycarbonate helmets on the market.